I am more of the conservative side when it comes to certain recipes. But a video on my Facebook feed got my attention. It showed different ways to make hummus. I especially liked the one that combined the hummus and tapenade, two of our favourite dippings so it couldn’t possibly go wrong. I use my trusty hummus recipe and added a small piece of roasted bell pepper with capers and olives. I still need to improve that but the result was good and my daughter who doesn’t like bell pepper liked it very much. 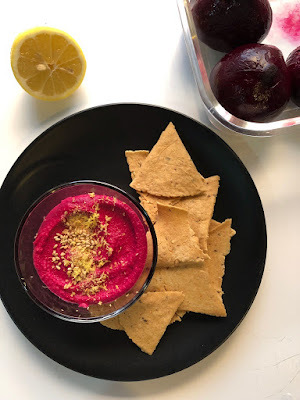 Anyhow, let’s get back to the matter that interests us; the roasted beetroot hummus! 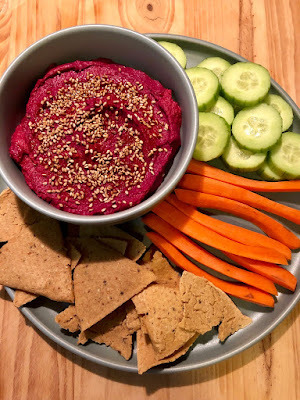 Same here, I used my original hummus recipe and arranged the condiments to balance with the sweetness of the beetroot. I simply roasted the beetroot in my Dutch oven for about 35 minutes at 200 degrees C or 400 degrees F and left them cool inside before peeling them. 2 cloves of garlic or 1 big – sometimes they are big! 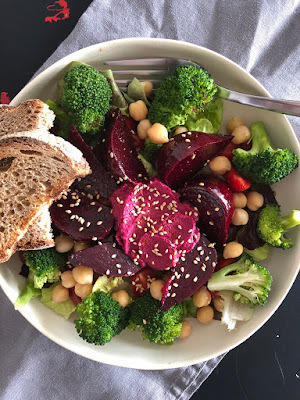 In a blender or food processor, add 2 to 3 tablespoon of the cooking water so it’s easier to blend, the condiments, the beetroot, the garlic, the drained chickpeas, and the olive oil. You can eat the hummus as it is on a vegetable plate with some pita bread chips or even better with some grain crackers. Served as evening appetizer; look at that colour! Hope you'll like it as much as we do!